The Bet365 ITV 4/1 Racing Offer is popular among matched bettors as it can be completed daily and return a steady profit. There are a few different methods for completing this offer which we will explain in this matched betting guide. The Bet365 ITV 4/1 Racing Offer awards users with a risk-free bet if they back a winner at odds of 5.0 or more on selected races. The offer is valid on all races televised live on ITV and ITV4 along with feature races which are announced by Bet365. The risk-free bet awarded when backing a winner with odds of 5.0 or greater is equal to the back stake up to a maximum of £50 and can be used on the next race shown live on ITV or on the feature race. ITV televises racing on Saturday's where there can be a number of eligible races for this offer. On days when ITV is not televising racing, Bet365 provide feature races for which the offer is eligible with. Offer only available on horse races shown live on ITV, ITV4 or on featured races. Winners must be backed at odds of 4/1 (5.0) or greater to be eligible for the free bet on the next race. Risk-free bet must be used on the next eligible race. Risk-free bet is equal to the stake on the winning horse up to a maximum of £50. Risk-free bet on next eligible race must be placed with own money and will be refunded as cash should it not win. As mentioned previously, there are a few different methods which you can use to profit from this offer. Some of the methods provide a higher return when they come in but do come with risk while others should return a profit every time but the profit will be lower. With this method you'll be using the standard back and lay strategy which you will be familiar with from completing other matched betting offers. To start, simply find a good match on the selected race using an odds matcher or a racing matcher. Ideally, you're looking for a match which incurs the smallest qualifying loss possible. Less than £2 is ideal. The image below shows a 99% match for Royal Ruby in the 15:35 at Huntingdon which is one of Bet365's featured races. Now that we have found a close match, we simply use a matched betting calculator to work out our lay stakes for our selection. The calculator below shows us that if we place a £50 back bet on Royal Ruby, we need to place a £50 lay bet on Matchbook.com. This will give us a qualifying loss of 57p whether our horse wins or loses. That's it. We now wait until the race has finished. If our horse loses, we have lost 57p and if our horse wins, we have qualified for a £50 risk-free bet on the next race. This standard matched betting method does not guarantee a profit but if you can find matches where your qualifying loss is kept to a minimum, you should return a profit over time. Given that the odds on our horse to win are 7.0, it should win one in every seven times on average. That means that we should receive a £50 risk-free bet by only risking £3.99 (£0.57 x 7). Using the Overlay strategy, we are able to eliminate our qualifying loss. By doing so, we reduce our overall profit slightly should our horse win but incur no loss should it not. The method for the overlay strategy is similar to the standard matched betting strategy expect our lay stake is slightly more to cover our qualifying loss. Using the same example as above, we place our £50 back bet on Royal Ruby to win with Bet365. 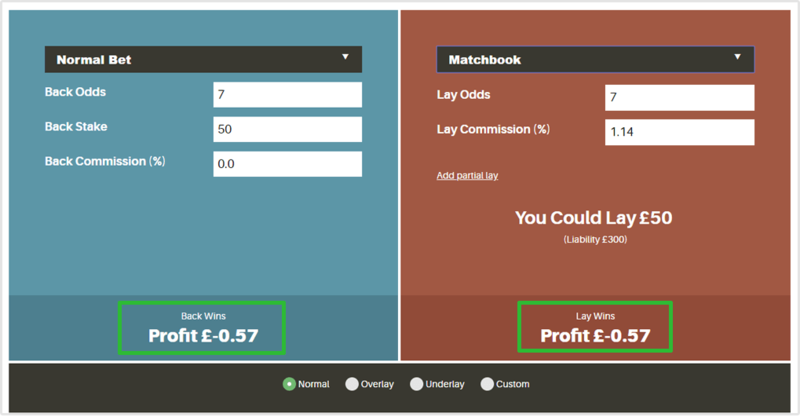 To work out our lay stakes we again use a matched betting calculator but this time we select the overlay function. You can see in the image below, by selecting the overlay function, our recommended lay stake has increased from £50 to £50.58. This means that if Royal Ruby wins we will incur a £4.06 qualifying loss but if it doesn't win, we will break even. As we would receive a £50 risk-free bet if our horse does win, a £4.06 qualifying loss isn't too bad! With the Expected Profit strategy we should be able to return a profit whether our horse wins or loses. The profit you will make using this strategy will be a lot less than if you land a winner using the previous two strategies but it can return a consistent profit for each and every eligible race. Please not that this strategy requires you to find very close matches or arbs in order to return a profit. We'll use the Royal Ruby example again and place our £50 back bet on Bet365. To work out our lay stakes for our horse we again use a matched betting calculator. We need to work out the lay stakes so that we make a profit no matter if our horse wins or loses and for this we select the 'Freebet on win' function. This is what the function is named on MatchedBets.com and may be called something else on other matched betting sites. This function takes into account the £50 risk- free bet you will receive if your horse wins and the fact that you should be able to exract a £40 profit from it. It then calculates your lay stakes to ensure an overall profit. The image below shows us that we should place a lay bet of £55.71 on Royal Ruby which would give us a profit of £5.07 if our horse does not win and a loss of £34.90 if it does. However, as we will receive a £50 if it does and can expect to extract a £40 profit from that free bet, we should make around £5.10 overall if our horse wins. If you back a winner at odds of 5.0 or greater, Bet365 will grant you a £50 risk-free bet. However, you will have to place the £50 bet with your own money and Bet365 will refund you in cash if your bet loses. You need to use this risk-free bet on the next eligible race. This means that you have to be available to place your back and lay stakes following the conclusion of the qualifying race. First you need to find another close match on the next race. Let's say we found a horse with odds of 8.0 on Bet365 and 8.1 on Matchbook.com. 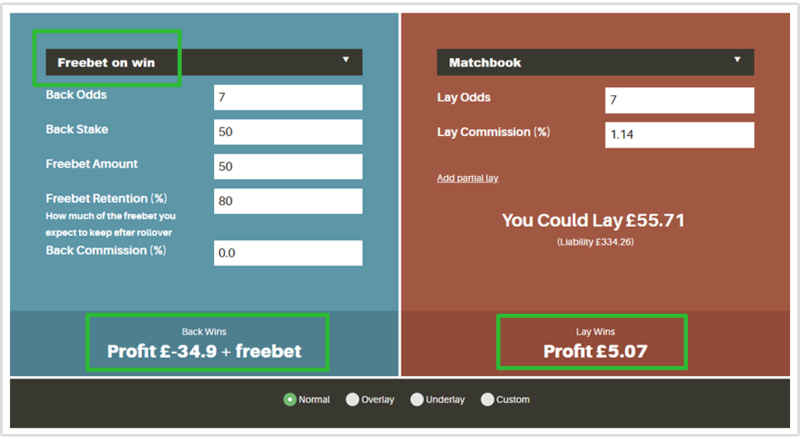 To work out your lay stakes to ensure maximum profit either way, we again use a matched betting calculator, but this time we use the 'free bet on win' function. You can see by placing a lay stake of £43.21 that we will return a profit of £42.72 if our horse wins and lose £7.28 if it doesn't. However, as Bet365 will refund our stake as it is a risk-free bet, we will return an overall profit of £42.72 also if it loses. The Bet365 ITV 4/1 Racing Offer is a great offer which has a positive Expected Value. You can either choose to take the risk with losing your qualifying loss but generate a high profit if your horse wins, incur no qualifying loss but slightly less profit if your horse wins or ensure you return a small overall profit using the Expected Profit method. One of the best things about this offer is that it can be done every day with the featured races and up to 10 times on a Saturday when ITV televise the live races making it a steady source of profit for all matched bettors.